The Pointer Plus is a modern convenient health device, that can give you the benefits, that are derived from a 4000 year old Chinese health science, that is now being called ELECTRO-ACUPRESSURE. 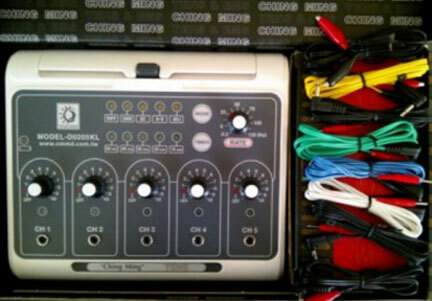 Electro acupuncture treatment is painless and effective pain relief is only 3-5 minutes away! It can produce a stronger stimulation, if desired, without causing tissue damage associated with twirling, lifting and thrusting the needle. Strong stimulation may be needed for difficult circumstances. It is easier to control the frequency of the stimulus and the amount of stimulus than with manual manipulation of the needles. Harmless - since the energy penetrating into the skin is relatively low, it does not cause tissue damage or the pneumothorax that can sometimes be caused by needles. Complete sterility - the operation is simple and there is no worry of cross-infection through incomplete sterilization of needles. Simple in operation - unlike needle application which requires a degree of skill in inserting and manipulation of needles. Meridians Massage is a form of Chinese manipulative therapy often used in conjunction with acupuncture, moxibustion, fire cupping, Chinese herbalism, Tai chi, and gigong. Practitioners use moxa to warm regions and acupuncture points with the intention of stimulating circulation through the points and inducing a smoother flow of blood and gi. Research, for example at Mugwort (Encyclopedia of Alternative medicine by Clare Hanrahan) has shown that mugwort acts as an emmenagogue, meaning that it stimulates blood-flow in the pelvic area and uterus. Cupping or simply cupping is a form of traditional medicine found in many cultures world-wide. It involves placing cups containing reduced air pressure (suction) on the skin. Gua Sha / Scrapping literally "to scrape away fever", more loosely, "to scrape away disease by allowing the disease to escape as sandy-looking objects through the skin"), is an ancient medical treatment. Sometimes Gua Sha referred to as "spooning" or "scrapping" by English speakers.